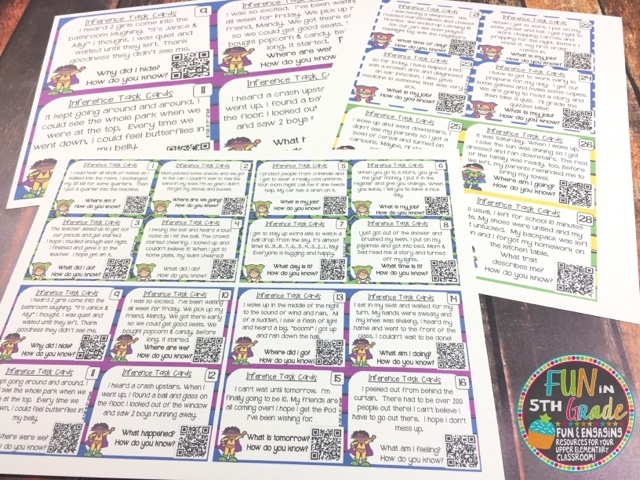 Do you see all the colorful things on Teachers Pay Teachers and Pinterest and wish you had the budget and the color ink to be able to print them?! Well, I’m here to tell you that you can! My school had zero options for printing in color but I wanted all the pretty things so I researched printer and cheap ink. 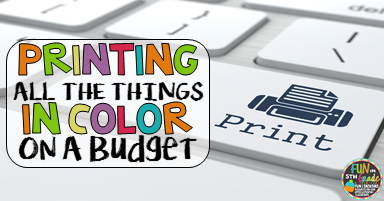 I’ve been printing in color, on card stock for years with very little out of pocket expenses and I’m here to tell you how you can too! First, you need to get a great printer. It can’t be just any printer you find on sale. You’ll need to find one you like but then also research the ink that it takes and see if there is a cheap version. (More about this later.) I’ve seen a lot of people mention how much they love the Hp Instant Ink option but I still find that my printer/ink is still cheaper than that for the amount that I print. My recommendation is to find a Brother printer you like since the ink can be found on Amazon for relatively cheap. Amazon affiliate link are used throughout this post. I get a small commission if you use the link to buy a product. The printer I have is no longer available but here is a link to the newer version of it if you’re interested. I’ve had mine for 3 years now and have no problems. I actually ended up buying one for home and one for school since we have no option to print color at school. This will obviously be the biggest expense in the beginning but will make it so you can print more in the long run. Once you find the printer you like, type it into a new Amazon search with the word “ink” to find the correct type of ink. Make sure you look at reviews because I have definitely had some mishaps buying generic ink from just anybody. Sometimes the cartridges wouldn’t work. If it’s one per pack I think it’s not so bad considering the price you get them for but more than that is no good. For the printer above there is ink you can get for around $30 for 12 XL cartridges (prices change frequently on Amazon) with great reviews! I print A LOT and 12 cartridges lasts me awhile. When you think about one brand name cartridge costing $30 each, this is an amazing deal! I then like to make sure I have plenty of card stock for all of my printing. If i’m going to be using my color ink, I want to make sure that I am printing it to last. 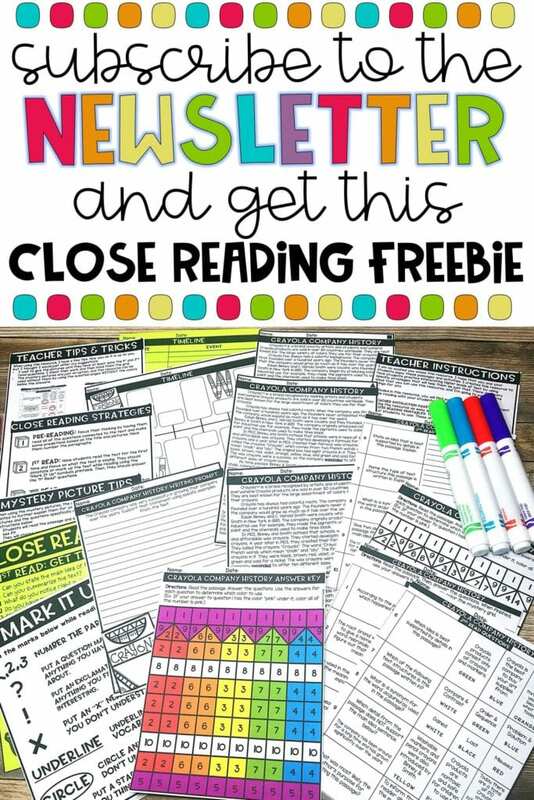 Print on card stock and then laminate so items that students will use and reuse will last longer. I get my card stock on Amazon because that is where I have found it to be the cheapest. here is the kind I buy….the pictured card stock. It is 90 lb thickness and bright white to make my color printing stand out even more! And, you can get 250 sheets for less than $10! Once you have your supplies, you are ready to start printing! But, before you do you should check and make sure that your settings aren’t wasting any of that precious ink. Go to your control panel or finder and to locate the printer and see its settings. Once you find your printer, click on it to see the different settings that you have. Now every printer is different but for mine there was a print quality setting and I chose to print everything in the “fast” setting. This setting uses minimal ink but still makes my resources look beautifully colorful. That being said, the option to do this was there when I print at school but the option is not there at home so if you can’t find it, don’t be alarmed. The next thing I sometimes do to save ink and/or paper is to print multiple pages of a resource on one piece of card stock. For example, I printed out these Inference Task Cards today. They are made to be four cards per page. If you look below, I have also printed them in eight cards per page and then sixteen cards per page. To do this, you just need to change a few setting after you hit “Print”in your PDF. 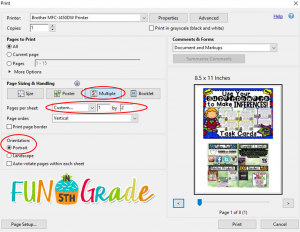 Below you will find the setting I use to print two pages per sheet. Your setting may look a bit different but you should still have the same options somewhere. 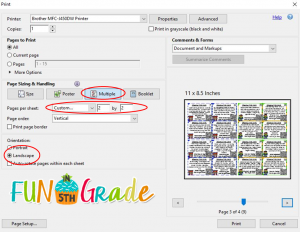 Below you will find the setting I use to print four pages per sheet. Your setting may look a bit different but you should still have the same options somewhere. Well, there you have. I hope you found some of these tips to be useful. Let’s face it, everything looks better in color! Have a great day and thanks for stopping by!